San Jeronimo Tlacochahuaya, Oaxaca is an agricultural town. 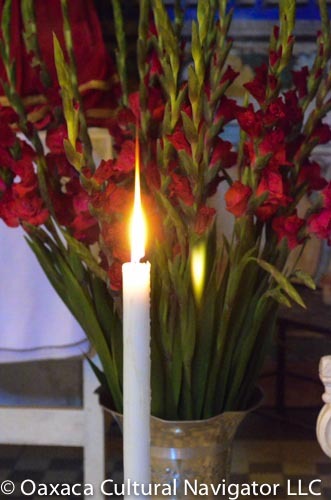 Farmers grow organic crops throughout the seasons: corn, squash, runner beans, garlic, garbanzos, flowers, and alfalfa. 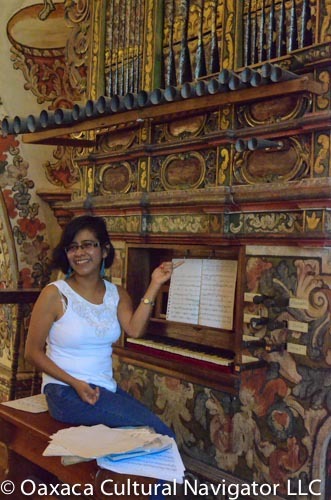 Mostly, Tlacochahuaya is renowned for its 1678 Baroque organ housed on the balcony above the 16th century gilded Dominican church sanctuary. It is a historic treasure. It is eleven o’clock Sunday morning and mass does not begin here until eight o’clock tonight. The circuit priest, who is based here and lives in the cloister, makes his rounds to serve nine villages in the Tlacolula Valley, serving mass at various times during the day. 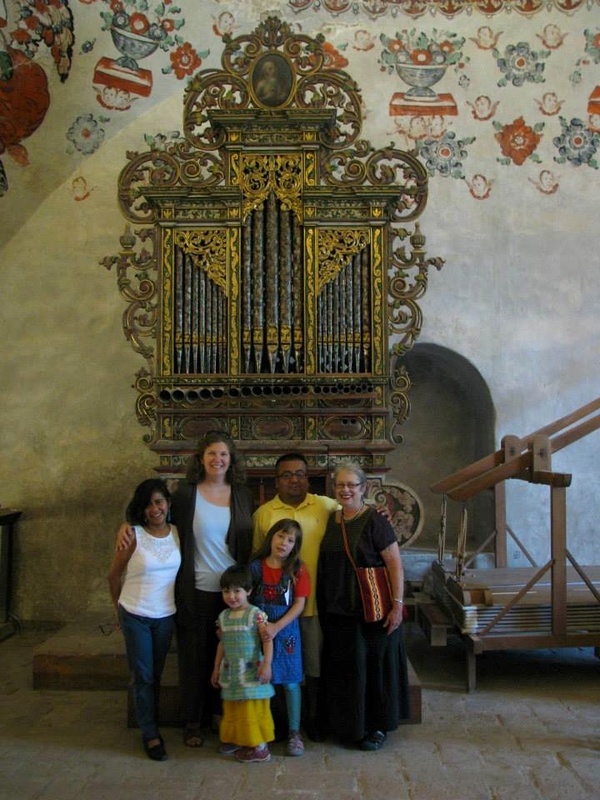 Moises Garcia Guzman and organist Soledad Hernandez Mendez invited us to see and hear this beautiful instrument. 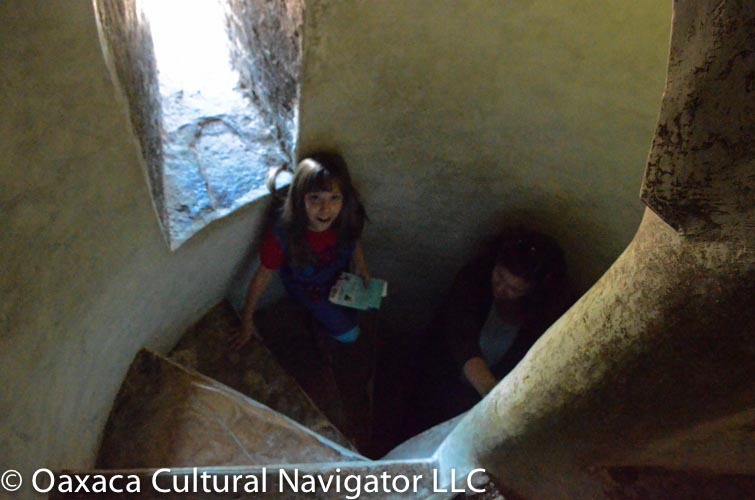 To get there, we climb a narrow, steep-stepped, stone stairway that winds from first floor to second. I remember similar in Rome and Paris, dark, damp and eerie. 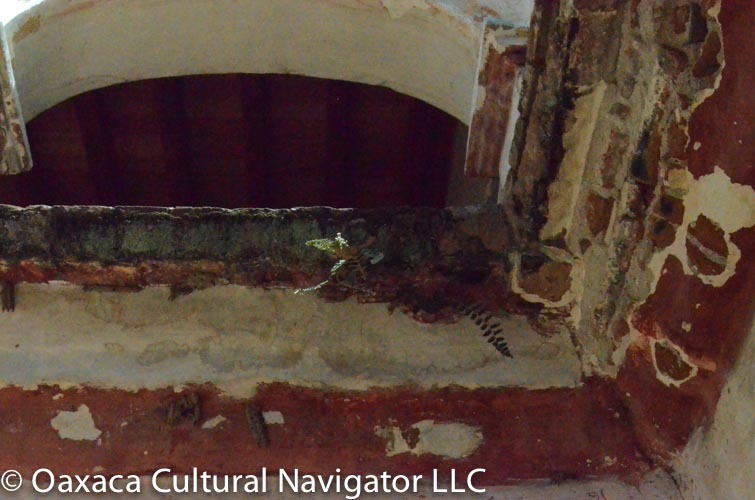 The steps spiral from the interior wall like an accordion. 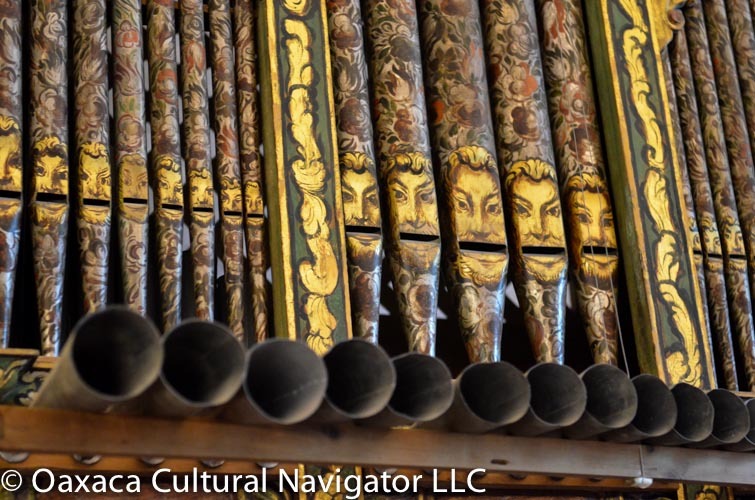 He describes the instrument as a modest organ with a big sound. Moises, born and raised in Tlacochahuaya (say..T-Lah-Koh-Chah-Why-Ya), lives in Los Angeles and works in the high-tech industry. A speaker of Zapotec, Spanish and English, he has dreams to return home to teach. He loves this place, and I see why. Moises explains the church and organ history as we stand under the dome in the center of the space. The organ sounds echo, reverberate from walls and ceiling, penetrate through me as if I am a porous receptacle, wrap me in comfort. The space is filled with so much sound that I cannot hear the words others are speaking just a few feet away from me. It is ethereal and meditative. I am reminded of Bach and Pachelbel. Soledad makes the ivory keys dance. 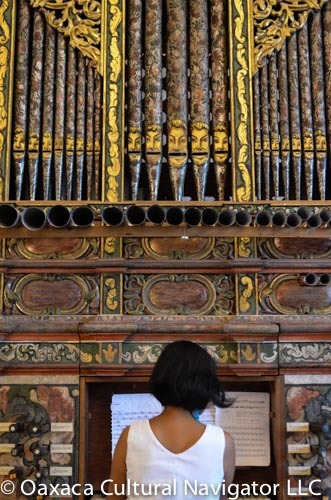 Known as an Organo Iberico, the organ was built in Oaxaca with Puebla influences. It has carderitas — big hips that flare, says Moises. It was constructed this way to contain the bellows. 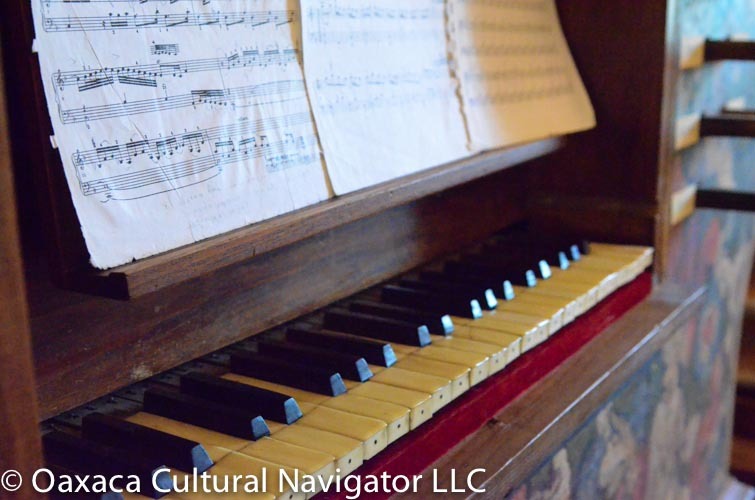 First built as a portable organ, the bellow controls were later moved from the side to the front when it was given its permanent place here. The organ was fully restored in 1995. The painting is exquisite. 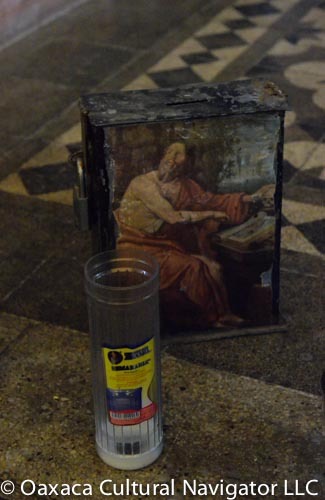 The church is undergoing continuous restoration. 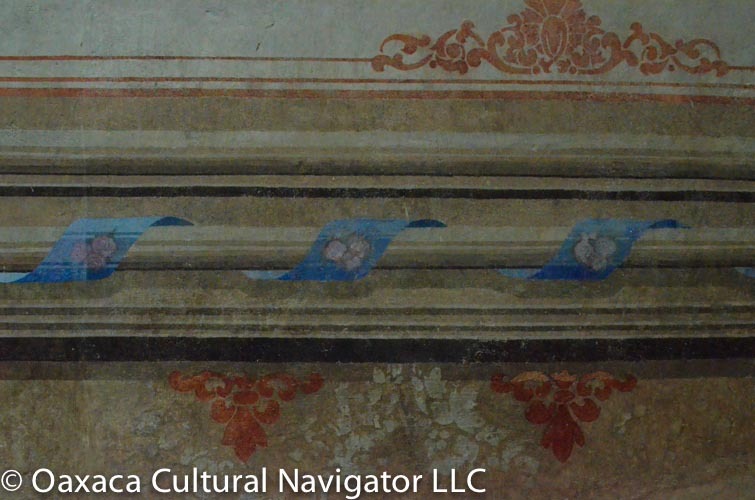 We are surrounded by frescoes, most of which have been renewed. 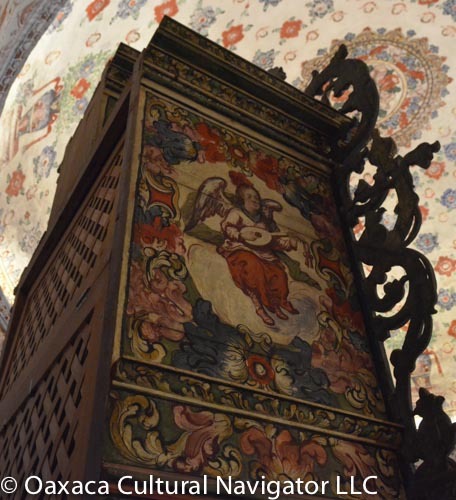 Yet back in the cloister and in some corners of the church, I see originals, shadows of their once prominent beauty faded, yet still glorious in design and remnants of color. 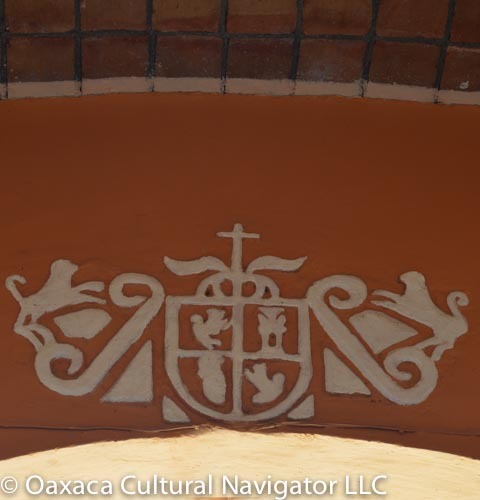 We sit on the adobe half-wall of the cloister. One priest still lives here. 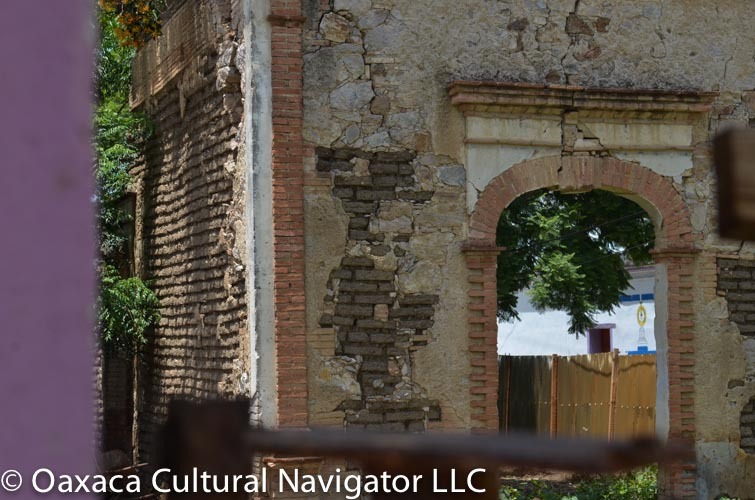 Once, this was the center of Dominican Catholicism for the entire valley. Though the town is smaller than many that surround it today, Tlacochahuaya retains its prominence as the the regional parish. After the conquest, it was the center of Spanish priestly and aristocratic life. 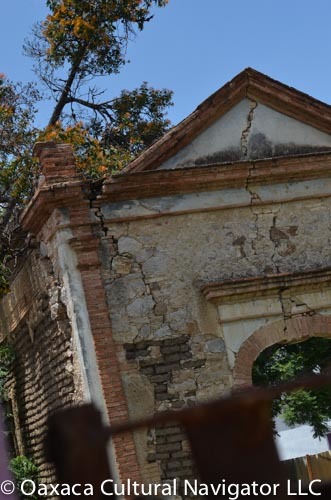 Crumbling haciendas and a coat of arms given to Tlacochahuaya by the Spanish attest to the glory days. 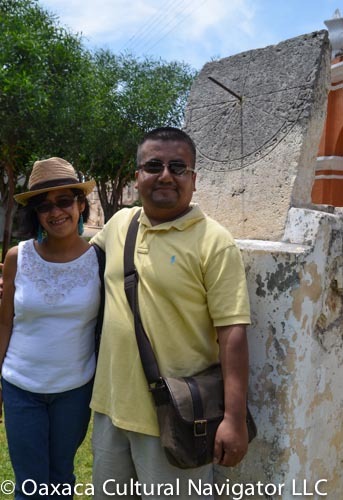 Moises and linguist Brook Lillehaugen talk about the influence of Fray Juan de Cordoba, who lived here in the cloister, translated Zapotec to Spanish, and created a dictionary. There were many priests who translated and made dictionaries, she says, but none compare to the one by Fray Juan de Cordova. As we complete the church visit and before we walk to lunch, we stop to look at the edifice of stone construction. 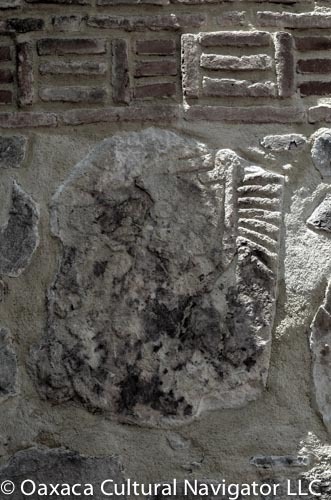 See the metate embedded into the wall. 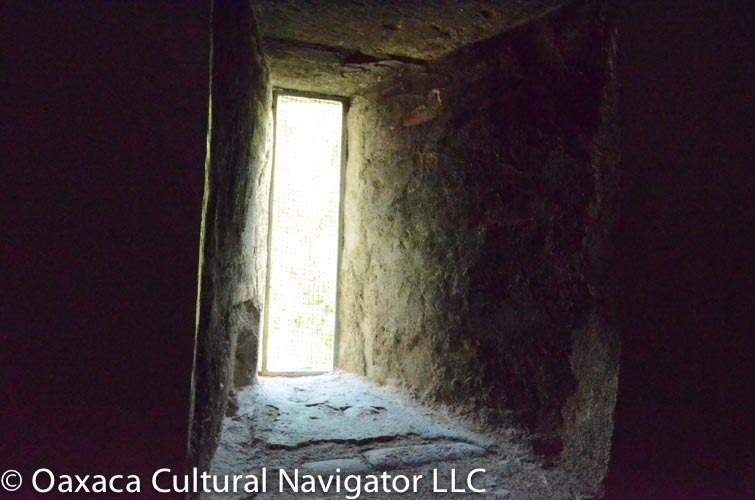 See the Danzante carved stone there, too. 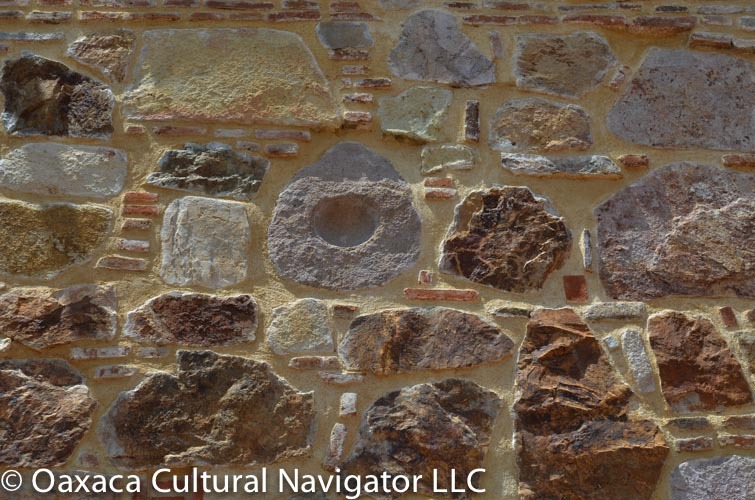 The church was built from stones taken from the Zapotec temple at Dainzu. Yet, the original Zapotec religion survived, was adapted, hidden in the iconography of the crucifixion and the new religion. Moises points to the figure of Jesus on the Cross (above left). Do you see the face of corn goddess there on his chest? he asks. How his ribs look like ears of corn? The figure was sculpted by locals and worshipped by the faithful. They say the priests never knew. 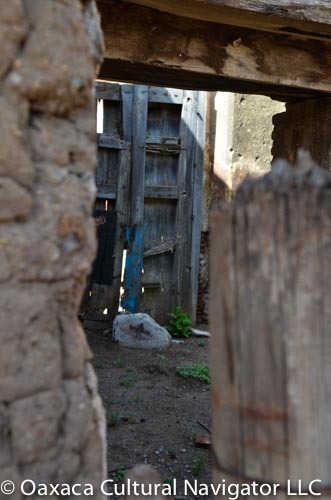 In 1926, Southern Baptist missionaries came to Tlacochahuaya to establish a foothold in the region and built a now decaying adobe sanctuary. 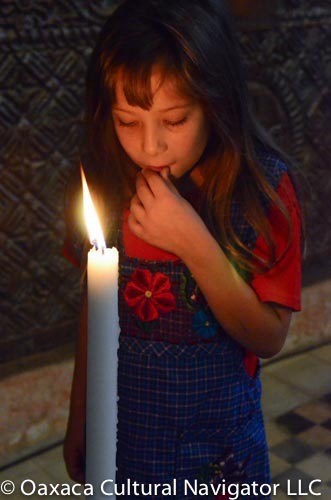 Today, religious beliefs are diverse and many Christians of various denominations live side-by-side with the predominantly Catholic population in towns throughout the valley. This entry was posted in Cultural Commentary, Oaxaca Mexico art and culture, Photography, Travel & Tourism and tagged Baroque, church, Dominican, Mexico, music, Oaxaca, organ, religion, Tlacochahuaya. Bookmark the permalink. Beautiful and very interesting! 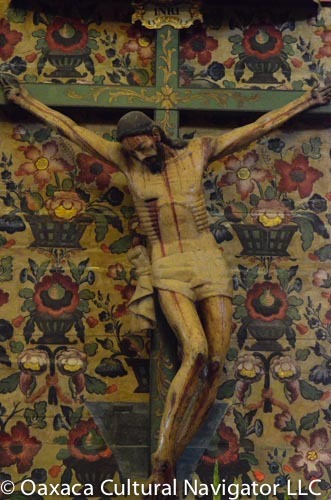 Wonderful photos – love the Jesus with the corn ribs.